Galway Chamber in partnership with The Gift Voucher Shop (GVS ), the company behind the One4all Gift Card, has launched a new gift card in the run-up to Christmas. This gift card allows employers in the city and county to reward and motivate their staff with a tax-free benefit and stimulate the local economy at the same time. 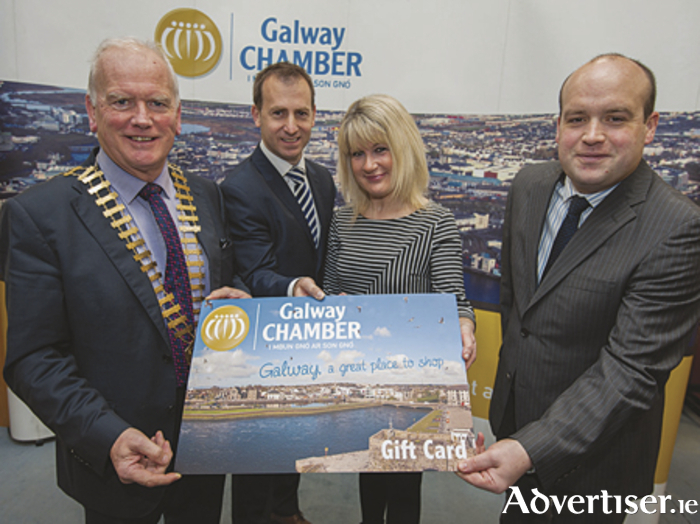 The Galway Chamber gift card can be used at more than 100 retailers across the city, county and on-line. Employers can reward their staff with up to €500 on a Galway Chamber gift card completely tax-free as a one-off benefit each year. The benefit is exempt from income tax, the Universal Social Charge (USC ) and employee and employer PRSI. The aim of the card is to help businesses reward and motivate their staff, maximise staff retention and increase customer loyalty. Research shows that increased motivation can boost employee productivity by as much as 44 per cent. Through the card employees will have access to a huge range of options, from treating themselves to a new outfit just in time for Christmas, a night away in one of Galway’s many top-quality hotels, or the latest gadgets and technology. The card is perfect for those companies wanting to improve employee motivation or customer loyalty. Any businesses wishing to purchase the Galway Chamber gift card can contact One4all directly on 01 -8708181 or e-mail [email protected]. Alternatively visit the Galway Chamber website www.galwaychamber.com for further information. Page generated in 0.1838 seconds.